Apple’s forthcoming OS upgrade, Lion, is all about gesture control. Swipe this way to do that, swipe another way to do the other. There are so many swipe and tap and slide commands, people will start writing cheat sheet apps to help other people remember them all. Your tired old mouse will still work, but it won’t do all those whizzy gesture tricks. If you use a desktop Mac, or a notebook that’s closed and plugged into an external display, the only way to take advantage of this shiny newness will be to buy one of Apple’s wireless Magic Trackpads. Ker-ching! 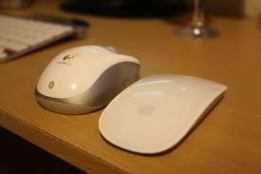 It’s not just Apple that’s out to kill off the mouse. Microsoft’s preview of Windows 8 last week showed that it was clearly built for touch. When it finally gets released, it will still work on older computers, with old mice plugged into them. But it will work better on touch-enabled devices. It’s the beginning of a slow, drawn-out end for the mouse. Like the cassette tape, it will continue to be manufactured for years, and used for even more years after manufacturing has ceased. Logically, that also means we’re going to see the decline of the word “click” as an instruction to computer users. Over time, it will lose its meaning. “Tap” and “touch” will take over. Still, if that means the end of the phrase “Click here!” on websites, I’m all in favor.